Scrum training and certification fulfills the vision of the Agile manifesto by fostering greater collaboration, productivity, and success among team members. Certified ScrumMaster® (CSM) certification is a globally accepted Scrum certification offered by Scrum Alliance to professionals who clear the CSM certification exam. A Certified ScrumMaster® helps project teams properly use Scrum, increasing the likelihood of the project's overall success. 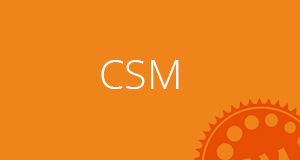 CSMs understand Scrum values, practices, and applications and provide a level of knowledge and expertise above and beyond that of typical project managers. CSMs act as "servant leaders," helping the rest of the Scrum team work together and learn the Scrum framework. CSMs also protect the team from both internal and external distractions. All are welcome to come and co-learn. There is no specific pre-requisites for the CSM training or examination. What is Empirical Process and Defined Process? How to go about implementing Scrum? What is the impact on Organization Structure and policies? What is Definition of Done and how a bad DoD can affect NPS? Discuss how the product evolves during the Sprint. Discuss the ceremonies and activities during the Sprint. Conduct Sprint Planning, Execute couple of Sprints, DSMs, Sprint Reviews and Retrospectives. What is involved in Release Planning? Are there any pre-requisites for joining the program? Basic familiarity with IT and IT frameworks (Agile, Lean, ITSM) is recommended. All Our Trainers are DevOps certified and highly qualified with over 15 years of experience in training and are working in the IT, Agile, ITSM and/or DevOps domain. Agile is fast taking over software development projects due to its myriad advantages over the traditional methods. In such scenarios, organizations are keen to embrace practices that will smoothen their adoption of Agile. DevOps is one such framework with strong liaisons with Agile and Lean that ensures numerous technical and business benefits that ultimately leads to delivery of good quality end-products. The DevOps certification scheme is aimed at individuals and organizations seeking a fundamental and common understanding of DevOps principles. These might include employees, managers, stakeholders and suppliers who are leading or contributing to an organization’s DevOps initiatives. Consultants who are guiding their clients through DevOps programs will also benefit greatly from DevOps certification. DevOps certifications are offered by the The DevOps Institute (DOI), which brings enterprise level DevOps training and certification to the IT market. This is the first level of the 3 DevOps Certification scheme, and more advanced levels include the Certified Agile Service Manager (CASM®) and the Certified Agile Process Owner (CAPO®). It was a great experience going through the training exercises and activities. The seminars were very engaging and had the right combination of instruction and activity.